Backlash (2003) was a professional wrestling pay-per-view (PPV) event produced by World Wrestling Entertainment (WWE). It took place on April 27, 2003, at the Worcester Centrum in Worcester, Massachusetts and starred talent from the promotion's Raw and SmackDown! brands. It was the fifth event under the Backlash chronology. The main event and featured match of the Raw brand was the encounter of Goldberg and The Rock, where Goldberg, in his first WWE Pay-Per-View, defeated The Rock by pinfall, following a spear and a Jackhammer. The featured match on the undercard was a WWE Championship match from the SmackDown! brand, between John Cena and the reigning champion, Brock Lesnar, where Lesnar defeated Cena by pinfall after an F-5. The other predominant match on the undercard was a six-man tag team match from the Raw brand, between the team of Triple H, Ric Flair, and Chris Jericho facing Shawn Michaels, Kevin Nash, and Booker T. Triple H, Flair, and Jericho won the match by pinfall, after Triple H hit Nash with a sledgehammer. The predominant undercard match from the SmackDown! brand was the encounter of The Big Show and Rey Mysterio, where Big Show pinned Mysterio after a chokeslam. The event grossed $450,000 with 10,000 ticket sales and had a 0.67 buyrate. Following the event, Goldberg began a feud with Chris Jericho. At Bad Blood, Goldberg defeated Jericho via pinfall after a Jackhammer. Brock Lesnar began a storyline with The Big Show over the WWE Championship. 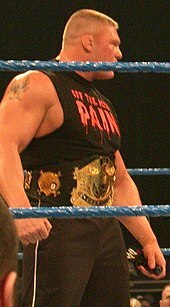 At Judgment Day, Lesnar defeated The Big Show in a Stretcher match to retain the WWE Championship. Triple H engaged in a storyline with Kevin Nash over the World Heavyweight Championship. At Judgment Day, Nash defeated Triple H via disqualification; due to WWE regulations, Triple H retained the championship. The main event at Backlash was the encounter of Goldberg and The Rock; the main feud from the Raw brand heading into the event. The feud began on the March 31, 2003 episode of Raw, where The Rock held a segment entitled The Rock Appreciation Night, a segment intended to promote his win against Steve Austin at WrestleMania XIX. During the segment, The Rock discussed the list of people he has beaten in his career including Steve Austin, wondering who would challenge him next into a match. Goldberg then made his WWE debut, as he came down to the ring and stated that he would be The Rock's next challenge. After the confrontation, Goldberg speared The Rock. The following week on Raw, Goldberg and The Rock had another confrontation, where Goldberg provoked The Rock into answering his challenge, but The Rock refused. The Rock finally accepted Goldberg's challenge on the April 14, 2003 episode of Raw via satellite. The week before Backlash, the feud intensified as The Rock held another segment entitled The Rock Concert, where he mocked Goldberg with Gillberg, a wrestler whose gimmick was to parody Goldberg. Later into the segment, Goldberg appeared from the audience and entered the ring, only to have The Rock execute a Rock Bottom on him. The predominant match at Backlash was a WWE Championship match between John Cena and the reigning champion, Brock Lesnar; the main feud from the SmackDown! brand heading into the event. Their feud began on February 13 on SmackDown!, when Lesnar and Cena last fought, which ended with Lesnar almost ending Cena's career by using the F-5 to propel his leg into a ring post. At WrestleMania XIX, Lesnar challenged for the WWE title held by then-champion Kurt Angle. Toward the end of the match, Lesnar botched a shooting star press when he underestimated the distance, slamming his head into Angle's side and ribcage. This stunned Lesnar and forced Angle to improvise the finish of the match. Lesnar then capitalized and regained the WWE title. On the April 3, 2003 episode of SmackDown!, then-General Manager, Stephanie McMahon announced a WWE Championship tournament, where the winner would receive a WWE Championship match at Backlash against Lesnar. John Cena was involved in the tournament, where he defeated Chris Benoit in the finals on the April 17, 2003 episode of SmackDown! to earn a WWE Championship match at Backlash. The week before Backlash, the feud intensified during a main event match involving Lesnar and A-Train, where Cena interfered by breaking a pinfall attempt by Lesnar. After the match, Cena hit Lesnar with his trademark chain and the WWE Championship title belt. Brock Lesnar faced John Cena at the event. The main match on the undercard from the Raw brand, was a Six-man tag team match involving the team of Triple H, Ric Flair, and Chris Jericho facing Shawn Michaels, Kevin Nash, and Booker T. The feud began on the March 31, 2003 episode of Raw, in a backstage segment, where Booker T was being medically attended following his title match with Triple H at WrestleMania XIX, as Flair came into the scene to confront and taunt Booker T. Later that night, Jericho cut a promo, where he complained that he should have won his match against Michaels at WrestleMania XIX. After the promo, Booker T defeated Jericho via disqualification after Flair interfered in the match and attacked Booker T. Afterwards, Triple H came down to the ring, where he, Jericho, and Flair attacked Booker T simultaneously. The attack caused Michaels to come down to the ring to help Booker T to no avail, as Jericho locked Michaels in the Walls of Jericho and Triple H locked Booker T in an Indian deathlock. The following week on Raw, Nash entered the feud during a main event tag team match between the team of Triple H and Jericho facing Michaels and Booker T. After Booker T pinned Triple H to earn the victory for his team, Flair came into the ring and attacked Booker T, followed by Jericho attacking Michaels with a steel chair. The attack led to the return of Nash, who had been sidelined with an injury, who attacked Jericho and Flair. After the turn of events, Triple H prepared to hit Nash with a sledgehammer, only to retreat the ring soon afterwards. The week later, Nash said that he wanted Shawn and Hunter to be friends again, only for Triple H to tell him that they should side together, as Shawn turned on Nash in 1994. Triple H and Flair fought against Booker T and the Hurricane and lost thanks to Shawn Michaels. Jericho then attacked Shawn and Nash came to the rescue, but accidentally hit Booker with the Sledgehammer. The feud intensified during the week before Backlash, during a main event World Heavyweight Championship match between Booker T, and the reigning champion, Triple H, with Michaels as the special guest referee. During the match, Michaels superkicked Triple H, resulting in Flair and Jericho coming into the ring and attacking Michaels and Booker T. Nash then came down to the ring, where he dispersed Jericho and Flair. He also helped Michaels and Triple H back to their feet, only to receive a low blow by Triple H.
The main match on the undercard from the SmackDown! brand, was the encounter of The Big Show and Rey Mysterio. The feud began on the April 17, 2003 episode of SmackDown!, during a tag team match pitting Mysterio and Tajiri against The Big Show and A-Train. The Big Show and A-Train won the match via pinfall. After the match, however, Tajiri sprayed green mist into A-Train's face, while Mysterio delivered a 619 on The Big Show, which caused him to collapse onto the floor. After the match in a backstage segment, The Big Show appeared frustrated with Mysterio for being embarrassed by him. The feud escalated during the week before Backlash, during a match between The Big Show and Tajiri. After The Big Show performed a chokeslam on Tajiri, Mysterio came down to the ring and distracted The Big Show, which caused The Big Show to chase Mysterio at ringside, resulting in Tajiri winning the match via countout. Before the event aired live on pay-per-view, Scott Steiner defeated Rico in a match on Sunday Night Heat, which aired on TNN. The first match was a tag team match for the Tag Team Championship between Los Guerreros (Eddie Guerrero and Chavo Guerrero) and Team Angle (Shelton Benjamin and Charlie Haas). The match began as Team Angle gained early advantage over Los Guerreros, after they performed a leapfrog stun gun on Eddie. Benjamin and Haas prevented Eddie from tagging Chavo into the match for a period of time, but Chavo was eventually tagged into the match, where he gained the advantage over Haas. While Chavo was the legal wrestler in the match, Eddie illegally entered the ring and executed a frog splash on Haas, only for an unsuccessful pin attempt by Chavo. After the pin attempt, Eddie and Benjamin fought onto ringside, where Benjamin tripped Chavo, who was in the ring about to perform a suplex on Haas. Benjamin held Chavo's leg down, allowing Haas to pin Chavo to retain the title. The second match was Sean O'Haire (with Roddy Piper) versus Rikishi. O' Haire gained the early advantage, as he clotheslined Rikishi. Rikishi was able to retaliate with a stink face attempt. Piper tried to hit Rikishi with a coconut, but Rikishi broke it over Piper's head. The distraction allowed O' Haire to perform the Prophecy on Rikishi for a pinfall. The third match was for the World Tag Team Championship between The Dudley Boyz (Bubba Ray Dudley and D-Von Dudley) and the reigning champions, Kane and Rob Van Dam, with Chief Morley as the special guest referee. The match began with Kane and Van Dam in control of the match, after Kane performed a spinebuster on Bubba Ray. D-Von, though, gained the advantage after delivering a sidewalk slam onto Van Dam. Later in the match, Kane regained control, which proceeded into a chokeslam attempt on Bubba Ray. Morley, however, gave Kane a low blow. Afterwards, Lance Storm attempted to interfere in the match on Kane and Van Dam's behalf, to no avail, which proceeded with a 3-D from The Dudley Boyz onto Morley, thus knocking out the official of the match. The distraction by Morley and Storm allowed Kane to successfully deliver a chokeslam, followed by a Five-Star Frog Splash onto Bubba, into a pinfall officiated by a new referee, to retain the title. The fourth match was for the Women's Championship, where Jazz, who was accompanied by Theodore Long, faced the reigning champion, Trish Stratus. As part of the storyline, Stratus came into the match with injured ribs and was advised not to wrestle by doctors, but was forced to wrestle by Raw General Manager, Eric Bischoff. Both women wrestled a back and forth match, until Stratus gained the advantage over Jazz by performing a Stratusfaction (springboard bulldog) on her. During the pin attempt, Long threw his shoe onto Stratus's head, causing the pin to be broken. The ending of the match saw Stratus attempting to perform a springboard sunset flip on Jazz, only for Jazz to counter it by sitting on her while grabbing the middle rope to win the title. The fifth match was The Big Show versus Rey Mysterio. Throughout the match, Mysterio used his quickness against The Big Show's size advantage, including performing two 619s on The Big Show. During a third attempt, Mysterio attempted a West Coast Pop but Big Show countered the move into a chokeslam for the pinfall. After the match, Mysterio was placed on a stretcher by EMTs. The Big Show picked up the stretcher with Mysterio still on it and slammed it against the ring post, similar to swinging a baseball bat. The sixth match was for the WWE Championship between John Cena and the reigning champion, Brock Lesnar. Lesnar gained the early advantage over Cena by performing a suplex and hitting Cena's head on the broadcast table. Cena retaliated as he threw Lesnar into the steel steps. Lesnar then delivered a spinebuster on Cena, regaining control of the match. After a spear from Lesnar which sent Cena into the ring corner, Cena attempted to push Lesnar into the referee to no avail. The distraction allowed Cena to hit a low blow on Lesnar. Cena attempted to hit Lesnar with a steel chain, though, the referee confiscated the chain before he used it on Lesnar. The situation allowed Lesnar to perform the F-5 on Cena to retain the title. The featured (and final) match on the main card, was a six-man tag team match between the team of Triple H, Ric Flair, and Chris Jericho facing the team of Shawn Michaels, Kevin Nash, and Booker T. The team of Triple H took the early advantage, after Triple H illegally entered the ring and performed a Pedigree on Michaels. Michaels' team, however, took control of the match when Nash was tagged in and attacked all three opposers. As Nash wrestled Jericho, Booker T performed the scissors kick on Flair, which proceeded into Nash and Triple H brawling at ringside, Jericho and Booker T brawling at ringside, and Flair and Michaels wrestling in the ring. As Flair and Michaels wrestled, Flair was able to lock in the figure-four leg lock, while Jericho illegally entered the match and performed a Lionsault on Michaels, who was locked in the hold. Nash, who continued to brawl with Triple H at ringside, noticed the turn of events and entered the ring where he delivered a Jackknife Powerbomb on Jericho and threw Flair onto the referee. As the referee was knocked down, Triple H hit Nash with a sledgehammer and pinned him, earning the victory for himself, Flair, and Jericho. In the main event, Goldberg faced The Rock. Early into the match, The Rock taunted Goldberg at ringside to avoid wrestling him. As The Rock reentered the ring, Goldberg performed a Rock Bottom on him to gain the early advantage. Goldberg went for a spear, but The Rock dodged it, resulting in Goldberg hitting the ring post. The Rock took advantage over the situation, as he locked Goldberg in a sharpshooter. Goldberg broke the hold by grabbing the ring ropes. The Rock attempted a Rock Bottom, but Goldberg speared him. The Rock was able to perform a spinebuster, Rock Bottom, another spinebuster and a People's Elbow on Goldberg for a near-fall. Afterwards, Goldberg delivered two spears and a Jackhammer for the pinfall. After Backlash, The Rock left WWE to focus on his acting career, as he filmed Walking Tall, a film co-produced by WWE Films, released in 2004. As The Rock left WWE, Goldberg began a feud against Chris Jericho on the April 28, 2003 episode of Raw, during Jericho's first episode of the Highlight Reel, an interview show, where Goldberg was the guest. During the segment, Jericho stated that no one wanted Goldberg in WWE, sparking a feud between the two wrestlers. Less than a month later, on the May 12, 2003 episode of Raw, a mystery assailant attempted to run over Goldberg with a limousine. The following week on Raw, Co-Raw General Manager Steve Austin interrogated several Raw superstars to find out who was the assailant. One of the interrogated was Lance Storm, who admitted that he was guilty. Austin then forced Storm into a match with Goldberg, who defeated Storm via pinfall. After the match, Goldberg forced Storm to admit that Jericho was the superstar who conspired Storm into running him over. On the May 26, 2003 episode of Raw, Goldberg yet again was a guest on the Highlight Reel, where Jericho and Goldberg agreed to a match at Bad Blood. At Bad Blood, Goldberg defeated Jericho via pinfall, after a Jackhammer. Brock Lesnar engaged in a feud against The Big Show over the WWE Championship. The feud began on the May 1, 2003 episode of SmackDown!, where Lesnar cut an in-ring promo against Big Show, stating that he was a coward for defeating Rey Mysterio at Backlash. The Big Show later appeared on the stage, where he challenged Lesnar into a WWE Championship match. The following week on SmackDown!, it was announced that The Big Show would face Lesnar for the WWE Championship at Judgment Day in a Stretcher match. Later that night, the feud escalated during a Handicap match between Chris Benoit and the team of The Big Show and A-Train. Benoit lost via pinfall; after the match, Benoit was double-teamed by The Big Show and A-Train. The double-team caused Lesnar to come and assist Benoit to no avail, as The Big Show performed a chokeslam on Lesnar. At Judgment Day, Lesnar defeated The Big Show in the Stretcher match to retain the WWE Championship. The aftermath of the six-man tag team match from Backlash, was a feud over the World Heavyweight Championship between Kevin Nash and the reigning champion, Triple H. The feud began on the April 28, 2003 episode of Raw, during a tag team match for the World Tag Team Championship involving Triple H and Ric Flair facing the reigning champions, Kane and Rob Van Dam. As Triple H attempted a pinfall on Rob Van Dam, Nash came down to the ring and chased Triple H to the backstage area with a sledgehammer. Triple H then ran towards a limousine, where Nash smashed the windows with the sledgehammer and threw it into the limousine, as it drove off with Triple H. The following week on Raw, Co-Raw General Managers, Austin and Eric Bischoff announced a World Heavyweight Championship match between Nash and Triple H at Judgment Day. At Judgment Day, Triple H was disqualified to retain the World Heavyweight Championship. ^ "WWE Backlash Venue". World Wrestling Entertainment. Archived from the original on 18 March 2008. Retrieved 2008-04-28. ^ a b "Goldberg defeats The Rock". World Wrestling Entertainment. Archived from the original on 31 March 2008. Retrieved 2008-04-28. ^ a b c d e f "Backlash 2003 Results". World Wrestling Entertainment. Archived from the original on 31 March 2008. Retrieved 2008-04-28. ^ a b c d e f "WWE Backlash 2003 Recap". Online World of Wrestling. Archived from the original on 20 April 2008. Retrieved 2008-04-28. ^ a b c d e f g h "WWE Backlash 2003 Results". Pro Wrestling History. Archived from the original on 10 April 2008. Retrieved 2008-04-29. ^ a b c d e f "WWE Backlash 2003 Results". CompleteWWE.com. Archived from the original on 11 April 2008. Retrieved 2008-04-28. ^ "WWE Bad Blood 2003 Results". Pro Wrestling History. Retrieved 2008-05-01. ^ "WWE Bad Blood 2003 Results". Hoff Co, Inc.: CompleteWWE.com. Archived from the original on 6 May 2008. Retrieved 2008-05-01. ^ "WWE Judgment Day 2003 Results". Hoff Co, Inc.: CompleteWWE.com. Archived from the original on 29 April 2008. Retrieved 2008-05-01. ^ "WWE Judgment Day 2003 Results". Pro Wrestling History. Archived from the original on 21 April 2008. Retrieved 2008-05-01. ^ Pankonin, Chris (2003-05-18). "5/18 WWE Judgment Day PPV report: Ongoing "virtual time" results". Pro Wrestling Torch. Retrieved 2008-07-01. ^ a b "WWE Judgment Day 2003 Results". World Wrestling Entertainment. Archived from the original on 27 March 2008. Retrieved 2008-05-01. ^ a b "WWE Raw (March 31, 2003) Results". Online World of Wrestling. Archived from the original on 19 April 2008. Retrieved 2008-04-28. ^ a b Powell, Jason (2003-03-31). "Ya, WWE Raw: Powell's Virtual Time Coverage (March 31, 2003)". Pro Wrestling Torch. Retrieved 2008-04-28. ^ a b "WWE Raw (April 7, 2003) Results". Online World of Wrestling. Archived from the original on 19 April 2008. Retrieved 2008-04-28. ^ a b Moore, Wesley (2003-04-07). "Nash returns as Diesel?". WrestleView. Archived from the original on September 15, 2008. Retrieved 2008-06-29. ^ "WWE Raw (April 14, 2003) Results". Online World of Wrestling. Archived from the original on 19 April 2008. Retrieved 2008-04-28. ^ Nemer, Paul (2003-04-14). "Flair & HHH vs. Booker & Hurricane". WrestleView. Archived from the original on September 5, 2008. Retrieved 2008-06-29. ^ a b "WWE Raw (April 21, 2003) Results". World Wrestling Entertainment. 2003-04-21. Archived from the original on 2003-06-04. Retrieved 2008-04-28. ^ a b Mahling, Mallory (2003-04-21). "4/21 WWE Raw: Mallory's "Virtual Time" Coverage". Pro Wrestling Torch. Retrieved 2008-06-29. ^ "h3/27 WWE Smackdown review: Sable returns, McMahon teases turn". Pro Wrestling Torch. Retrieved 2008-06-29. ^ "WWE SmackDown! (April 3, 2003) Results". World Wrestling Entertainment. 2003-04-03. Archived from the original on 2003-04-23. Retrieved 2008-06-29. ^ a b Ouellette, Christopher. "#1 Confedership Determined". WrestleView. Archived from the original on October 15, 2008. Retrieved 2008-06-29. ^ a b Bethel, B.J. (2003-04-17). "4/17 WWE Smackdown review: Cena vs. Benoit for title shot". Pro Wrestling Torch. Retrieved 2008-06-29. ^ a b "WWE SmackDown! (April 24, 2003) Results". Online World of Wrestling. Archived from the original on 22 April 2008. Retrieved 2008-04-28. ^ a b Ouellette, Christopher (2003-04-24). "Cena/Lesnar, more". WrestleView. Archived from the original on August 28, 2008. Retrieved 2008-06-29. ^ a b c Widro (2003-04-27). "A largely predictable PPV that featured solid in ring action and a nice debut for Goldberg". 411Mania.com. Archived from the original on 6 May 2008. Retrieved 2008-04-29. ^ a b c d Powell, John. "Goldberg suffers Backlash". Canoe: SLAM Sports-Wrestling. Retrieved 2008-04-29. ^ a b c Martin, Adam (2003-04-27). "WWE Backlash 2003 Results". WrestleView. Archived from the original on February 23, 2012. ^ a b Keller, Wade (2003-04-27). "Backlash (2003) Results". PWTorch. Retrieved 2008-06-29. ^ a b c d "WWE Backlash 2003 Results". Warned.net. Archived from the original on 7 May 2008. Retrieved 2008-04-28. ^ "2003: April 27". Pro Wrestling Illustrated. Archived from the original on 5 July 2008. Retrieved 2008-06-29. April 27: Bill Goldberg defeats The Rock at Backlash. ^ "The Rock Biography". About.com: Professional Wrestling. Retrieved 2008-05-01. ^ a b "Linda McMahon names Stone Cold RAW's new Co-General Manager!". World Wrestling Entertainment. Archive.org. 2003-04-28. Archived from the original on 2003-06-04. Retrieved 2008-06-29. ^ a b Moore, Wesley (2003-04-29). "WWE Raw (April 28, 2003) Results". WrestleView. Archived from the original on 29 March 2008. Retrieved 2008-05-01. ^ "Christian eats steel on RAW". World Wrestling Entertainment. Archive.org. 2003-05-12. Archived from the original on 2003-06-04. Retrieved 2008-06-29. ^ Mahling, Mallory (2003-04-12). "5/12 WWE Raw: Mallory's "virtual time" coverage". Pro Wrestling Torch. Retrieved 2008-06-29. ^ Mahling, Mallory (2003-05-19). "5/19 Raw review: Mahling's "alternative perspective" rundown". Pro Wrestling Torch. Retrieved 2008-06-29. ^ "Jericho: "I Did It"". World Wrestling Entertainment. Archive.org. 2003-05-19. Archived from the original on 2003-06-04. Retrieved 2008-06-29. ^ Mahling, Mallory (2003-05-26). "5/26 WWE Raw review: Ric Flair teams with Michaels against Hunter". Pro Wrestling Torch. Retrieved 2008-06-29. ^ "The Dirtiest Player & The Game wreak havoc". World Wrestling Entertainment. Archive.org. 2003-05-26. Archived from the original on 2003-06-04. Retrieved 2008-06-29. ^ Keller, Wade (2003-06-15). "6/15 WWE Bad Blood PPV: Ongoing "virtual time" results of event". Pro Wrestling Torch. Retrieved 2008-05-01. ^ "WWE Bad Blood 2003 Results". Online World of Wrestling. Archived from the original on 20 April 2008. Retrieved 2008-05-01. ^ "WWE SmackDown! (May 1, 2003) Results". PWWEW.net. Archived from the original on 6 May 2008. Retrieved 2008-05-01. ^ Jennette, Brad (2003-05-01). "A must see segment highlights an otherwise blah Smackdown". 411Mania.com. Archived from the original on 6 May 2008. Retrieved 2008-05-01. ^ "WWE SmackDown! (May 8, 2003) Results". Online World of Wrestling. Archived from the original on 10 May 2008. Retrieved 2008-05-01. ^ Jennette, Brad (2003-05-08). "If Mr. America and stretchers are your thing, then this show was totally for you, brother". 411Mania.com. Archived from the original on 6 May 2008. Retrieved 2008-05-01. ^ a b "WWE Judgment Day 2003 Results". PWWEW.net. Retrieved 2008-05-01. ^ "Judgment Day Main Event". World Wrestling Entertainment. Archived from the original on 29 March 2008. Retrieved 2008-05-01.